Mothers of newborns get asked the question all the time: “Is your baby sleeping through the night?” I came to dread the question. Certainly, I cringed inwardly when other moms answered in the affirmative. A well-meaning pastor told me, “Things will get easier when he’s three months old.” Three months came and went. My firstborn didn’t get the memo. Quite frankly, I struggled and strained. I longed for that elusive sleep. My constant prayer was for God’s help and mercy. At a year and a half, my little guy finally slept more than just one or two hours at a stretch. When my second, third and fourth babies arrived, I was prepared. Prepared to not sleep. Yes, I still yearned for rest, but I sensed that acceptance provided me something. I wasn’t losing energy through the mental battle. 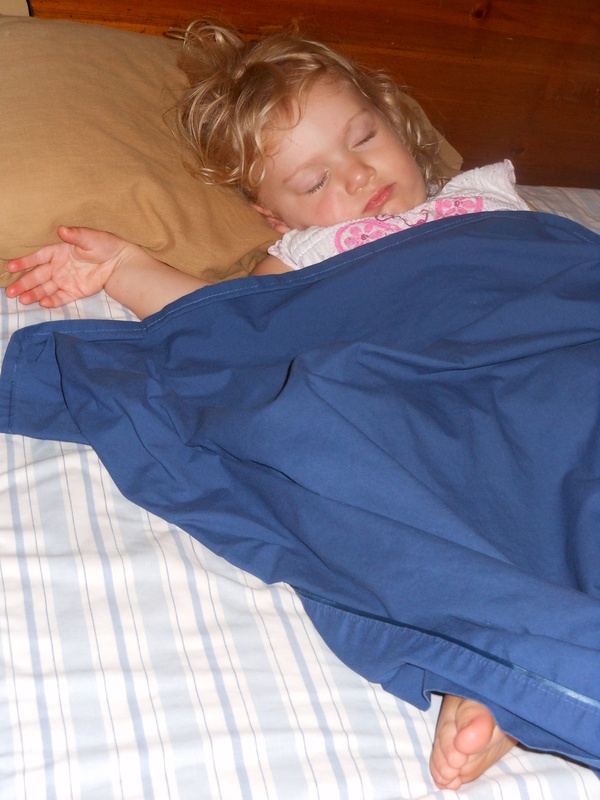 My fourth child finally “slept through the night” at twenty one and a half months. But who’s counting?! I’ve come to learn that sleep is still not a guarantee. With four kids, I am woken nearly every night. As a light sleeper, I wake easily and rarely fall back to sleep quickly. When I began to look at what are my greatest fears in life, I made a discovery. Even though I had learned something about acceptance when nursing newborns, I had hardly arrived. Every day and night, I face the same nagging anxiety: Will I get enough sleep? Nothing can trigger my irritability more than kids who won’t cooperate with going to bed. Lately, I’ve been struck with the irony. I can get exasperated with kids during the long bedtime routine, because I’m longing for refreshment. Why? Not exclusively, but primarily, so I can be a more loving person and mother. Then why sabotage that in a rush to get to bed? Several years ago, I listened to an audiobook autobiography of a young girl living in Germany during the horrors and poverty caused by World War II. Her mother was diligent and persevering, doing everything she could to provide for her children amidst the deprivation. Then one day, her youngest daughter ruined her only shoes in an innocent childish romp. It seemed a death note for the cold winter. The mother snapped. So desperate was she for her daughter’s welfare. And in that despair, she beat her daughter severely, without any semblance of control. Of course, the actions of the mother were absurd and inexcusable. But I don’t condemn the woman; I ache with her. That is one of the many reasons I am passionate for those in abject poverty. Can you imagine seeing your own children suffering, starving, dying…and not being able to do anything about it? Love for one’s offspring has no economic distinctions. Those in extreme poverty love their children like we do. They work day and night, they struggle and pray. And yet all seems hopeless. Every day 22,000 die due to conditions of poverty. Every day! These are deaths that are preventable. And yet they cannot be stopped by the love of the impoverished parent. I often think of the simple golden rule, “Do to others as you would have them to do.” What if I had been born in such low and desperate circumstances? I would long for an opportunity to get out—for me, but quite frankly, even more for my babies. This year, we read as a family two different biographies about Christians in labor camps—one in Nazi Germany, the other in Soviet Russia. The prisoners were worked mercilessly. By the end of the day, they were bone tired. Yet they could not fall asleep at night. Why? Extreme hunger. Imagine how many mothers and children today have restless nights because of that same agony. Seeing little ones suffer is so devastatingly painful. The problem is big and we wonder how on earth we can help. One of the most exciting things for me has been to discover Compassion International. Why am I so passionate about Compassion? Through their comprehensive child-centered approach, we actually can break the cycle of poverty. It is not a quick band-aid. To sponsor a child requires a $38 per month commitment. It’s a lot, because it works. I saw first-hand the beauty of lives changed by Compassion in the Dominican Republic. Even more compelling is a recent two year study of Compassion’s sponsorship, by the University of San Francisco, which validates Compassion effectiveness. The study was published in the “Journal of Political Economy.” To read more about Compassion’s success, click here. Through child sponsorship, we can help heal a family. It’s not just the child that benefits; we touch the hearts of each relative who cares. Visit Sponsor a Child. Here you will find children from 26 different countries, ready to be loved in action and not just word. Help a child sleep soundly, with a nourished belly—from this moment. Sleep through the night. I may never experience that again. Yet, my hope is that I will not walk in fear. May I embrace those waking moments with gratitude. With perspective, I see that my lot is so much better than it could be. I am awake, but safe and nourished; so are my children. If I’m willing, I can take my wakefulness as an opportunity to trust Jesus for the strength that I long for. Of course, I still try for a nap whenever I can. My youngest, now three, entered my room while I was attempting an afternoon siesta. Her sweet voice asked, “Mommy, may I tuddle (cuddle) with you?” Climbing into my bed, she began to chatter away for several minutes. Finally, I asked, “Elena, can you be quiet so that mommy can sleep?” Her reply was, “Otay, mommy. I just love you SO much.” One of us fell fast asleep. Gosh, she’s cute when she snores.